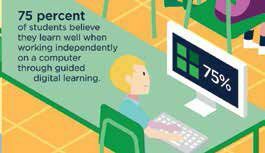 * 61 percent would like to continue to learn math through multiple approaches. * 68 percent like math. * 61 percent are interested in a future career in science, technology, engineering, or math. * 80 percent believe that having multiple chances to solve the same problem helps them learn. * 70 percent believe a few quick questions at the end of class are a good way to help ensure they are learning. * 68 percent of students like working with different students and teachers over the course of the year.